The term desert conjures up images of endless barren sand dunes, but the Kalahari is not like this at all. It is well vegetated in many places, with a wide variety of habitats and grasslands that stretch forever. Including tree savannah, sparse scrubland, mature forests and tall grasses tolerant to sandy soil, as well as a surprising number of lilies. 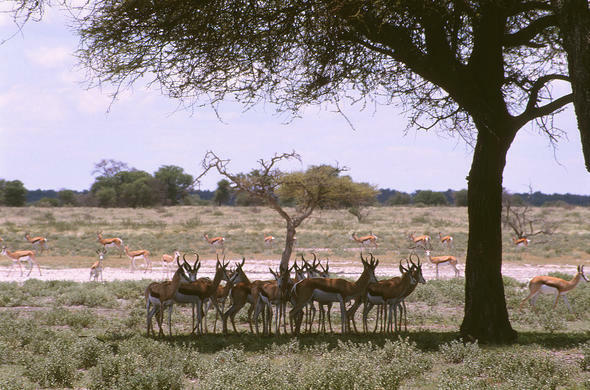 The Kalahari covers eighty percent of Botswana and as rainfall is low and there is no permanent surface water, the balance of survival can be a precarious one. The southern part of the Central Kalahari Game Reserve (CKGR) is the driest and most susceptible to drought, while the northern sector expects annual rains anytime from November to March. 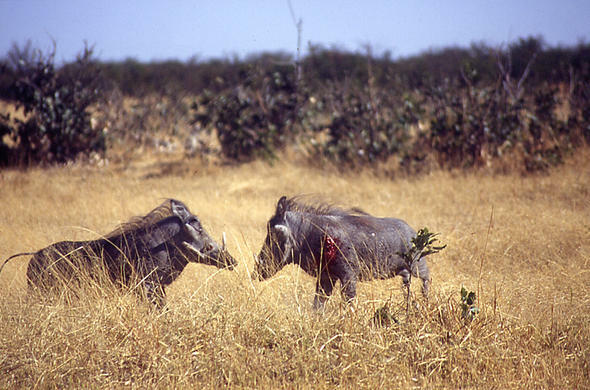 During this green season an incredible Zebra and Wildebeest migration occurs, which few people seem to know about. Thousands of grazing animals flock to the northern grass plains. San Bushmen are the ultimate survival experts and know exactly where to find water-filled tubers in the sand or how to catch an Ostrich - which is no easy task! The Bushmen are great storytellers and like nothing better than to embellish a tale with elaborate and hilarious re-enactments, accompanied by fast and furious dialogue in their incredible clicking language.Very few communities are able to still live the simple nomadic existence that once came naturally to them. The modern world does not allow or encourage such a lifestyle any more.Survival of the Bushmen became an issue in 1961 when Botswana was still a British Protectorate, and the Central Kalahari Game Reserve was formed as their homeland. Many have intermixed with other tribes and live in villages at the southern end of the reserve. Only the hardiest independent travellers travel to this reserve, but those that do are rewarded with untamed Africa at its best and spectacular starry nights.